Ramu and his wife, Gauda, are a striking couple. Their colorful clothes stand out in the shadows of a hut where they are showing us their goats. When asked for a photo, they bend down to pick up the animals and look at each other with barely contained laughter, pride and shared understanding from years together. 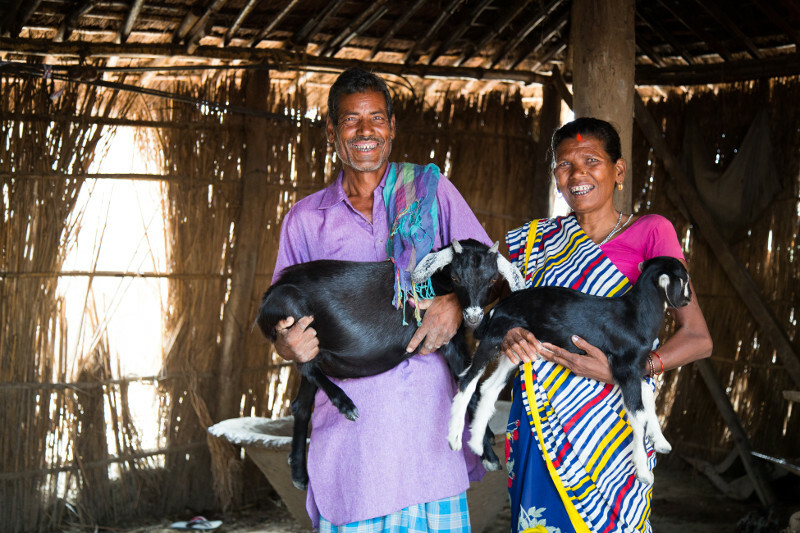 The goats, healthy and spry, are a source of food, money and opportunity. They received them as part of a Catholic Relief Services project to improve their family’s well-being. The couple lives with their children in Barriya, a village of West Champaran district in the state of Bihar, India. It’s a place where boys as young as 6 often abandon school to work outside the village so they can help support their families. Children often travel hundreds of miles away, toiling long hours in textile factories, construction and other industries—in unsafe conditions. “When children leave to work, there is no proper food. At the same time, wages are not very regular. 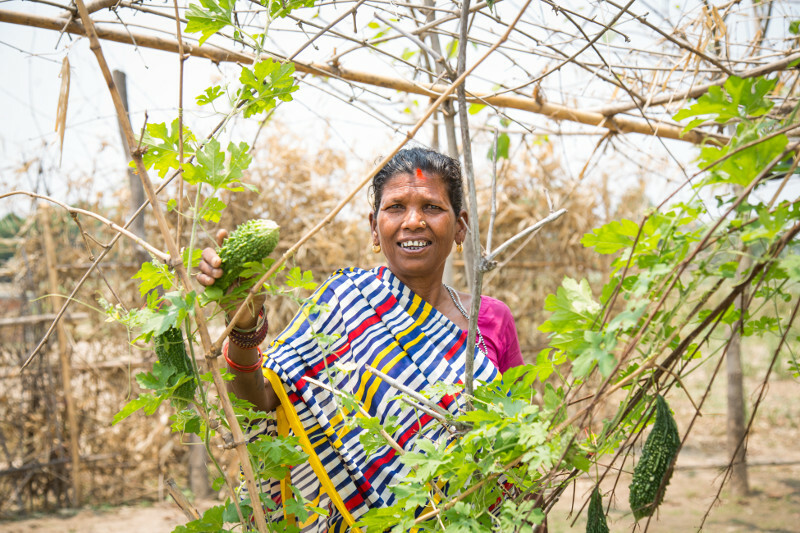 They are promised, but they’re not given,” says Supriya Mukherjee, a CRS program officer in India. “Some children come back with disabilities and some are tortured,” says Mukherjee. Ramu and Gauda’s older sons are among those who left to find work at early ages. While they have returned to the village, they have not returned to school. The parents enrolled their family in the CRS project to try to keep their youngest son in school. When children who left their villages return with possessions like cell phones and jeans, it can encourage others to abandon their education—and their village—in search of a different life. Nearly 1.3 million children in Bihar work instead of attending school, according to official census figures. But Indian officials believe the number is higher. Because of Bihar’s location, close to the border with Nepal, it is a major transit point for women and children who are trafficked both into and out of the country. Through a generous grant from the Vista Hermosa Foundation, CRS and our partner Bettiah Diocesan Social Service Society work with 100 poor families in 5 villages in Bihar, where about 24% of school-age children are not attending school. The goal is to provide their families with livelihood support, to emphasize education and to raise awareness about the dangers of child migration. Village-based child protection committees work with the families so they can access resources, including money for social services and better agricultural opportunities. Families are shown videos about the negative effects of child migration. In peer groups, children learn about the harmful effects of migration, and they have opportunities to discuss ways to make schools and their villages more child friendly. While the project focuses on boys, girls also participate in project activities. One-third of the students re-enrolled in school are girls. The harmful effects of early marriage are raised in awareness campaigns and through peer groups. So, although Gauda’s youngest son still does not attend school regularly, her youngest daughter does. By raising awareness about the value of education, the CRS project has motivated more parents to send their children to school: 99 children have been re-enrolled. Still, 362 children remain out of school. And the cultural norms that play a role in child migration can take longer than one generation to change. Besides education and awareness, Ramu and Gauda’s family also receives vegetables, fruit and sugarcane seeds, and access to safe water through the CRS project. Their crops are more plentiful, which adds to their income. And their goats are also living a good life. Livestock health volunteers provide vaccinations, and the animals now have a shelter—constructed with local materials and workers—to protect them from predators. “After being connected to the project, my goat has grown. I am happy my goat has a house where it can live. There is a door. Now, the dogs, wolves and other animals cannot harm its children,” says Gauda. Since she is blind in one eye, Gauda is also grateful the project helped her to get a disability pension. She encourages other women in the community to attend project activities, which have helped her understand the value of investing in education for her children, she says. Her greatest hope is that her family will continue to thrive for years because of the support they are receiving now. “My grandchildren will go to school and study,” she says.